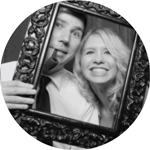 A food blog with simple and tasty recipes. On a relaxing weekend down south Brooke and I had some time to make ourselves a proper meal. After stopping in the small town of Kirrup, on our way to Bridgetown. We picked up some quality produce at a small grocer which sells all locally grown fruit and vegetables. With the ingredients we picked up, and a couple of other things we bought in town. We decided to make our own version of a classic creamy chicken linguine. 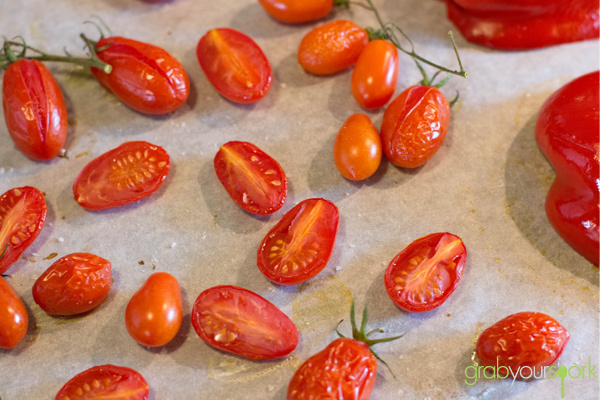 To enhance the flavours some more, Brooke roasted off the vine ripened tomatoes and capsicum. While the vegetables were in the oven, you need to also brown the chicken before adding to the pasta later as it seals in the juices and keeps the chicken moist. If we were making this dish during the week, we wouldn’t roast the veggies first. However, with the luxury of a little extra time we decided to oven roast the tomatoes and capsicum which definitely took the recipe to another level in terms of flavour. Not only is this dish full of colour, there is something about a creamy pasta dish that is so comforting – it’s a perfect dish to have on a cold winters day. 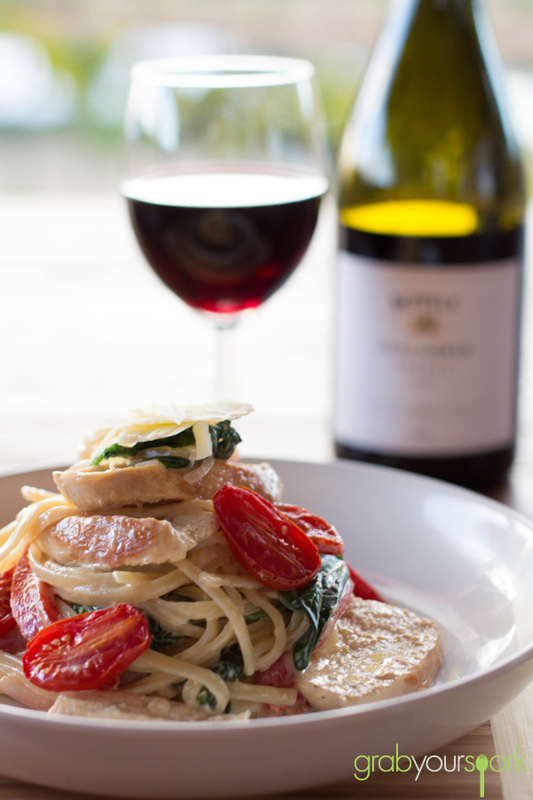 This creamy chicken linguine paired with a glass of Shiraz, was definitely a great way to finish off a relaxing day down south! If you love your chicken like I do then try these recipes for chicken, bacon and leek pies or chicken pakora. 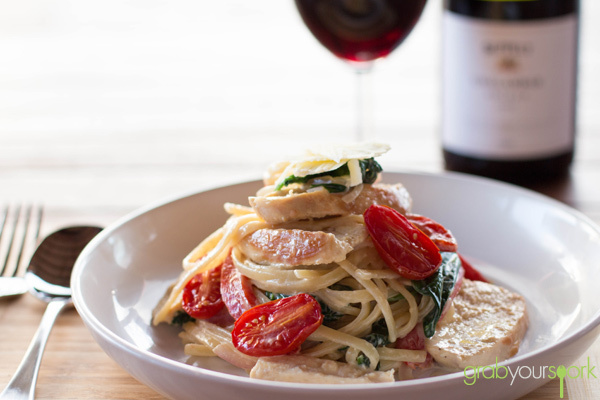 Creamy Chicken Linguine made with fresh local ingredients including spinach, baby Roma tomatoes, capsicum and red onion. 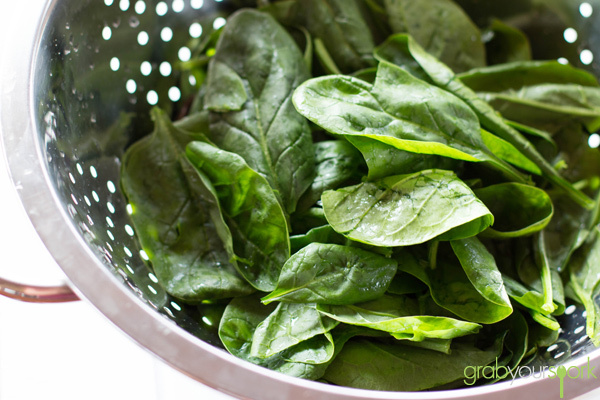 Wash tomatoes,capsicum and spinach well. Cut the capsicum in half. 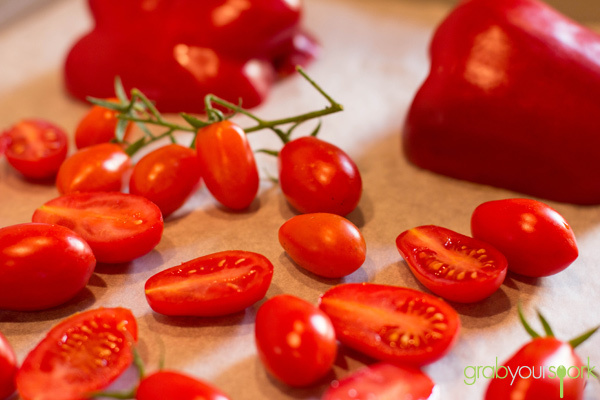 Scatter the tomatoes and capsicum on a baking tray. Cook for approximately 15 minutes. Allow to cool before removing the skin off the capsicum and slice into long strips. Prepare the pasta according to package directions. While the pasta is cooking, heat the oil over medium-high heat in a large pan and sauté the onion until tender and translucent, about 5 minutes. Add the garlic and cook for another minute. Add the chicken and cook until it has a nice brown colour and is no longer pink. 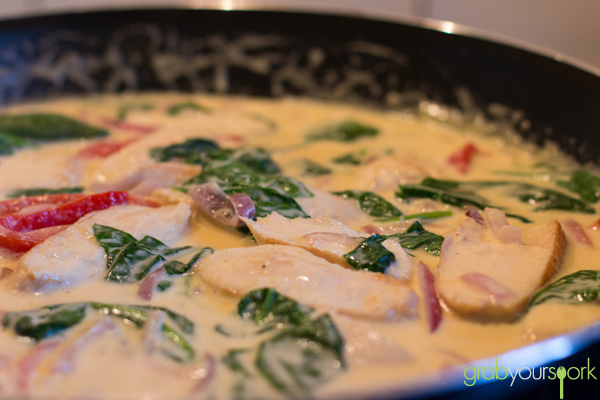 Add the cream, milk and garlic to the chicken and onions. Once the cream/milk is simmering, add the fresh spinach, capsicum strips and some of the roasted tomatoes. Drain the pasta and add it to the pan. Toss in the sauce to coat. Add the fresh basil leaves and toss to combine. 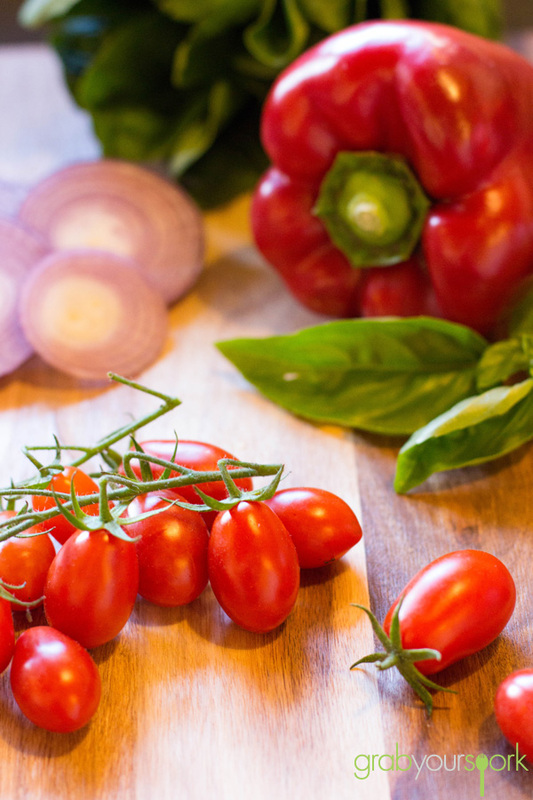 Serve immediately, with the remaining tomatoes, some freshly ground black pepper and grated Parmesan cheese. The combination of cream and milk makes the pasta dish a little lighter, however this can be substituted with carnation milk also. Sign up to receive email updates with our latest recipes!